This is a simple dish perfect for busy weeknights. It’s even faster if you make the pesto ahead of time and already have a batch of it in your fridge, which I highly recommend. Why, you ask? Because this pesto goes with literally everything, from chicken to pork, to fish, to pizza, and of course, pasta! 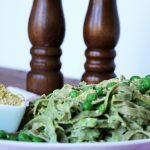 After my Vegan Butternut Squash Pasta, this is my kids’ second favourite meal, which is awesome because its super quick to make and it gets them eating their greens. Now you could of course up the protein ante on this dish by simply adding a cup or two of chicken, shrimp or even chickpeas. Healthy and happy cooking! Cook pasta according to package directions, then drain and toss with olive oil. 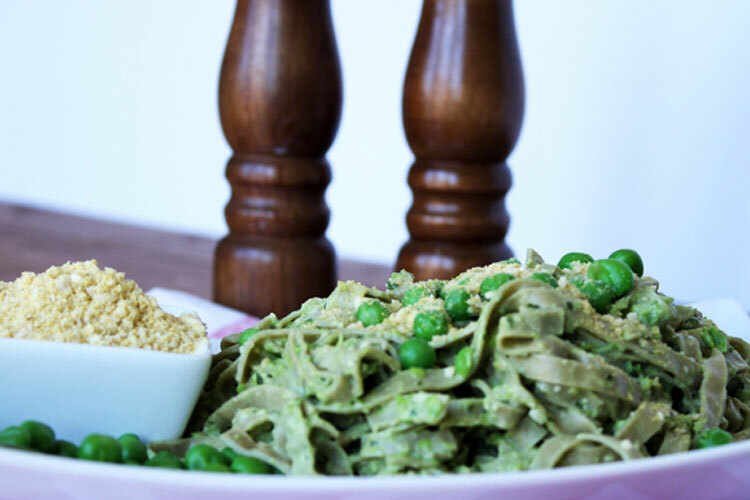 Stir the pesto into the pasta, toss in the peas, season with salt and pepper and serve immediately.